A sustainable margaret river house design with a small budget and compact site. A Margaret River owner of this small block knew there was going to be some challenges from the outset trying to create a margaret river house design with two distinct living spaces on a 360 square metre site. This led her to engage Margaret River architect Threadgold Architecture to bring her vision to life. With a small budget and even smaller space to work in, the Margaret River architect required fresh thinking and passion for this margaret river house design. The owner’s desire to capitalise on the rise in airbnb accommodation and create two separate living spaces without an additional storey required a fresh approach by the Margaret River architect. The margaret river house design by Margaret River architect Threadgold Architecture responds to the natural beauty of its Margaret River setting with the surrounding landscape providing a palette of natural materials of rammed limestone, locally sourced Australian hardwood timbers, corrugated steel and weatherboard-look cladding. A long rammed limestone spine wall extends from the front entry pivot door through the margaret river house design to the first light-filled interior living space. The rammed limestone wall provides a sense of solidity and strength and also provides pragmatic benefits of thermal mass for the passive solar margaret river house design. The central gallery-style hallway in the heart of the home with highlight windows, connects the entry and juxtaposed living spaces. The hallway highlight windows generate an ever-changing play of light in the margaret river house design throughout the day. Cut-outs in the floor plans and raking ceilings ensure that this margaret river house design conforms to passive solar design principles with each living space having the potential for solar heat gain during the cooler winter months. 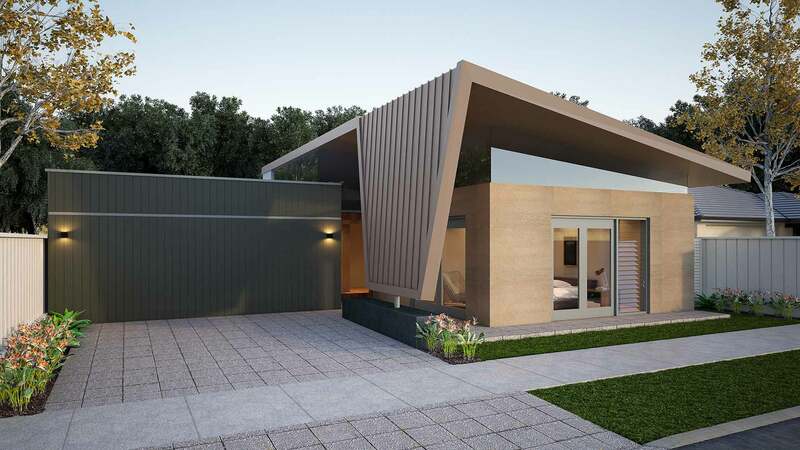 The owner’s brief provided to the Margaret River architect placed significant importance on the design principles of sustainability and energy-efficiency due to the margaret river house’s latitude and location. This margaret river house design cleverly achieves passive solar principles on a difficult north-to-south orientated site. Each juxtaposed living space catches the winter heat gain, when the sun is at its lower azimuth, and eliminates the worst of the summer heat gain. The Margaret River architect also incorporated hallway highlight windows that maximise natural light through the daylight hours and vent stale hot air along the rammed limestone spine through ‘stack effect’ ventilation. The Margaret River architect also strategically located fenestration to maximise cross-ventilation and the adjustable Vergola roof cover to the court ensures that the owner can enjoy indoor-outdoor living throughout the wet season.